Last night, in lieu of watching television, I got a wool blanket that I had picked up at Value Village for $4.00 and went out into the backyard with a book and the beagle. I made a quick match coat from the blanket, and read a Tom Clancy book until the light fell and my eyes began to strain. My chair began to feel uncomfortable so I ran downstairs, grabbed a closed-cell foam camping mattress, and brought it outside. Using Monty's toy as a pillow, I lay on the mattress, wrapped in my wool blanket match-coat, watched the stars and the high blinking jet planes track across the dark night sky. Monty sat all cuddled up against me, watching for raccoons and cats. It was a nice evening, and the stars began to come out in a sky illuminated by a bright gibbous half-moon. I am reminded that I watch too much television, do too little reading, and even less watching the stars these days. I seem to watch TV a lot these evenings, it's become a bad habit of mine. I guess the winter months reinforce the habit. But sitting outside away from the television screen, and reading - well, this is a habit that I would like to develop. Before I sign off, let me quickly write about match coats. A match coat is a covering made from a single wool blanket. A match coat may have derived its name from robes and blankets made from matching pieces of fabric, stitched together so that they match. 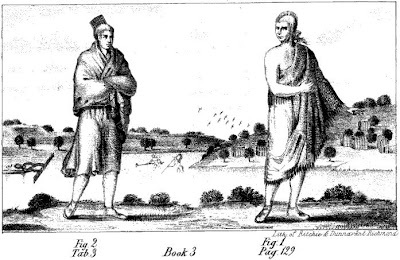 Europeans made their match coats from thick wool blankets which were commodities in the early 1600s in North America. An extremely useful item, the wool blanket can be used as a shelter, a sleeping bag, or quickly converted into a 'match-coat' with little more than a sash or a rope, and a wooden pin. I just picked up a thin dead twig from the lawn, smoothed and sharpened it using a small piece of rough stone, and pushed it through both edges of the blanket where I drew it together at the chest. I then used a small piece of garden twine that I found in the grass to secure the pin in place. I could have carved a C-shaped pin from wood and not have needed the twine instead. "Figure 1 wears the proper Indian match coat, which is made of skins, dressed with the fur on, sewed together, and worn with the fur inwards, having the edges also gashed for beauty sake. [...] Figure 2 wears the Duffield match-coat bought of the English [...]." I found a pictorial describing the process. The instructions there are to simply drape the match coat over your head and down your back, with the center of the edge at your forehead - keeping enough to form a bit of a hood in case of inclement weather. Secure the blanket at the the waist with rope, belt, sash, pin, etc., and then form a hood and secure at the chest with pin, stick, etc. Note that you can cover your pack or equipment on your back with the match-coat. As it warms up just drop the blanket off the shoulders.